Rural drinking water supply in India is predominantly based on groundwater which is being increasingly recognized as unsafe due to presence of several chemical contaminants having serious health implications. One of these is arsenic, prolonged ingestion of which in concentrations higher than 0.01 mg/l can cause arsenic poisoning, a condition commonly called 'arsenicosis', which results in severe carcinogenic and non-carcinogenic effects. About 239 million people across 153 districts in 21 States of India are estimated to be exposed to these health risks from arsenic in groundwater-based drinking water sources. The worst affected States are West Bengal (W.B. ), Bihar, Assam and Uttar Pradesh (U.P. ), with W.B. as the first State to report health impact of arsenic in groundwater in 1983. According to 2017 data from Government of India, 8,066 habitations in 14 of the 19 districts of W.B. 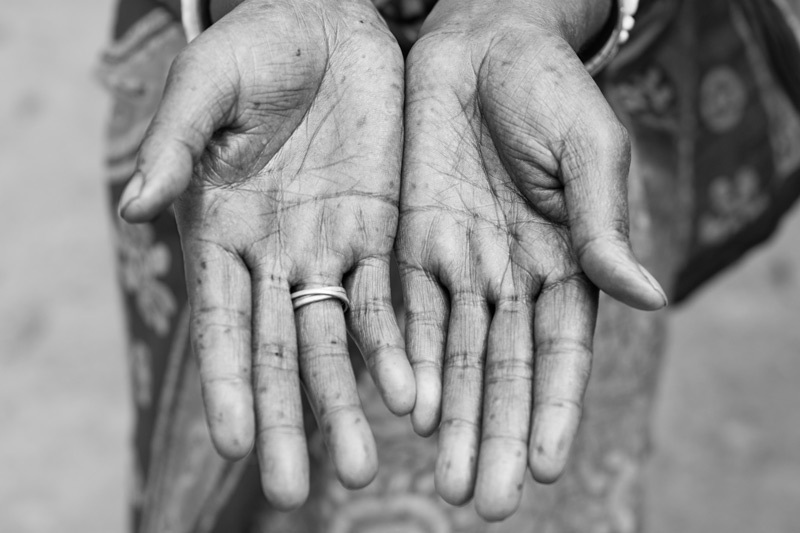 are arsenic-affected, with 10.4 million population at risk. The district North 24 Parganas has the highest number of arsenic-affected habitations (2,699), exposing over 2 million to the risk of arsenicosis. It is obvious that drinking arsenic-rich water thwarts enjoyment of the human rights to water, health and several other concomitant rights by men, women and children in the affected areas and is a major impediment to sustainable development. Therefore, supply of safe drinking water for all in these areas is an urgent need. Towards this end, two major approaches have evolved over the years: first, treatment of the contaminated groundwater to remove arsenic before supply and second, supply of arsenic-free water which can be sourced from arsenic-safe aquifers or surface water from rivers. However, none of these appear to have stood the test of time in supplying safe drinking water to all due to challenges of acceptability, accessibility, efficiency, technical feasibility and maintenance, affordability, and environmental sustainability. 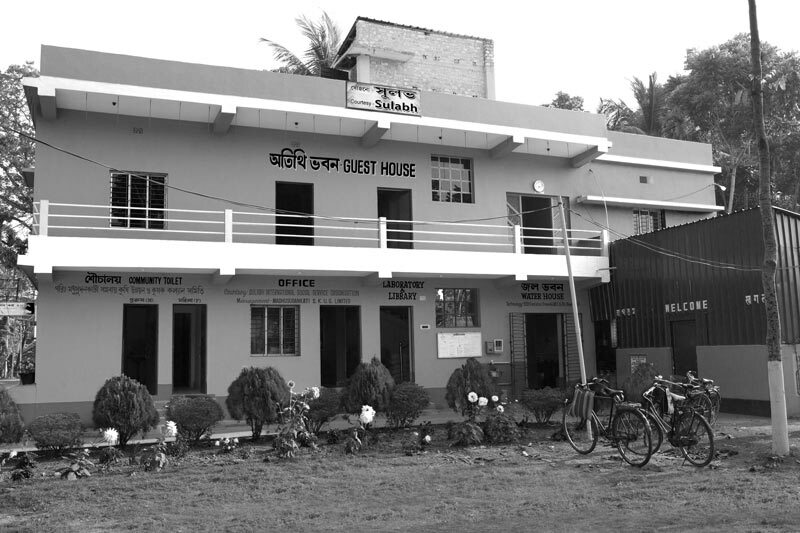 Against this background, Sulabh International Social Service Organisation (SISSO) has implemented an innovative approach in an arsenic-affected village named Madhusudankati in North 24 parganas district of W.B. The approach comprises a nature-based solution for safe drinking water which is simple, user-friendly, highly acceptable at community level, affordable, efficient, and environmentally sustainable. 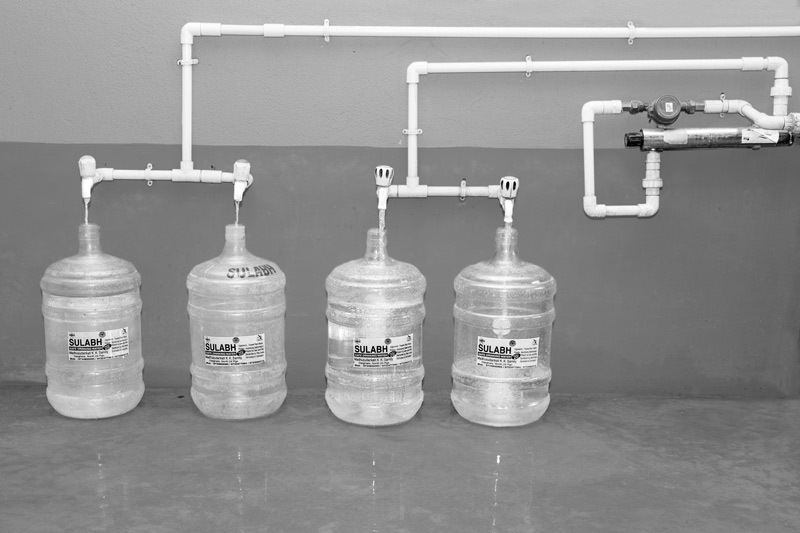 Referred to commonly as the 'Sulabh Safe Drinking Water Project', it comprises an essentially decentralized community-based water supply system where rainwater collected in a drinking water pond is purified using a combination of simple technologies, packaged and then distributed at a very nominal price of less than one rupee (approx. 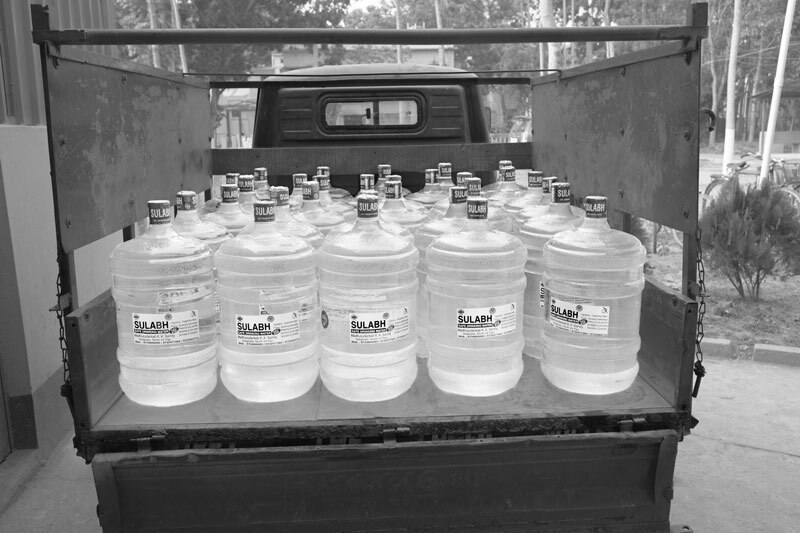 0.02 USD) per litre, with free supply to arsenicosis patients, schools and ICDS child care centres. This photo story presents this unique innovation of SISSO implemented in Madhusudankati village of W.B. and explores its merits as a sustainable solution for 'leaving no one behind' in accessing safe drinking water in quality-affected areas of India. 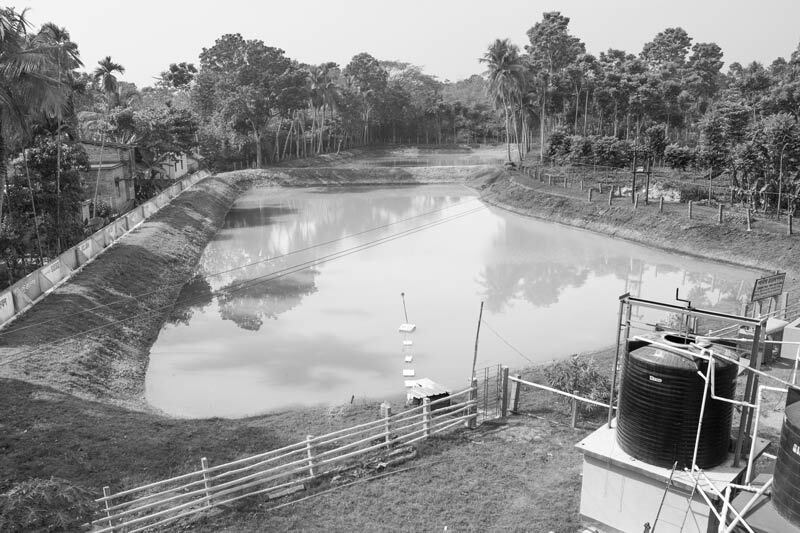 The title photo depicts a view of the well-protected drinking water pond along with a part of the water treatment plant in Madhusudankati. A view of Madhusudankati village located in North 24 parganas district, W.B. 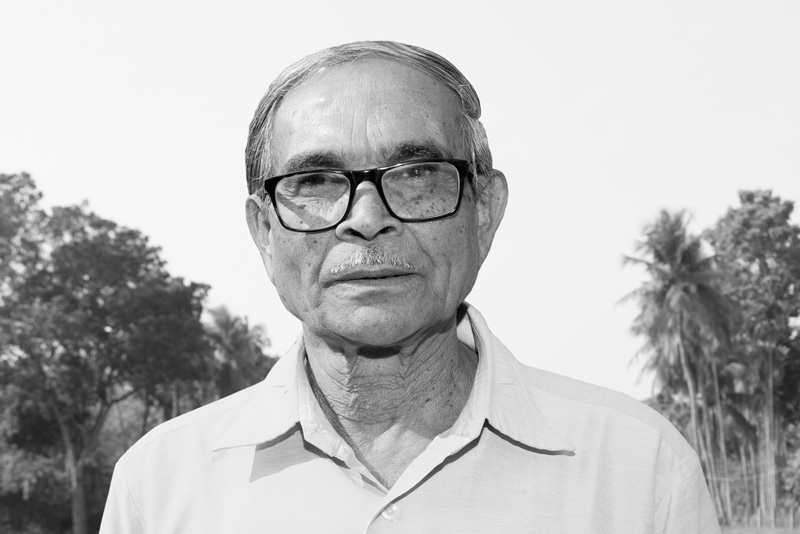 Madhusudankati is a medium sized village within Sutia Panchayat in Gaighata block of North 24 parganas. It is located about 60 km north of Kolkata and barely 14 kms from the Bangladesh border, where districts Satkhira and Jessore are severely affected by arsenic in groundwater. As per the Census of 2011, Madhusudankati has a population of 972, with 495 men and 477 women residing in 244 households. According to a study in Gaighata block reported in 2010, groundwater in all its 107 villages contained arsenic above the WHO standard of 0.01mg/l, and further, in 91 villages above 0.05mg/l, which is the 'permissible' limit recognized in India in the absence of any alternate safe source. According to this study, more than 100,000 people in the block were already drinking arsenic-contaminated water in 2010. A total of 40 arsenic-affected individuals have been identified in villages Madhusudankati, Bishnupur, Faridkati and Teghoria and in all, eight men and two women have already died of arsenicosis. Against this backdrop, the Sulabh safe drinking water project was started by SISSO in Madhusudankati for providing safe drinking water in the village and nearby. 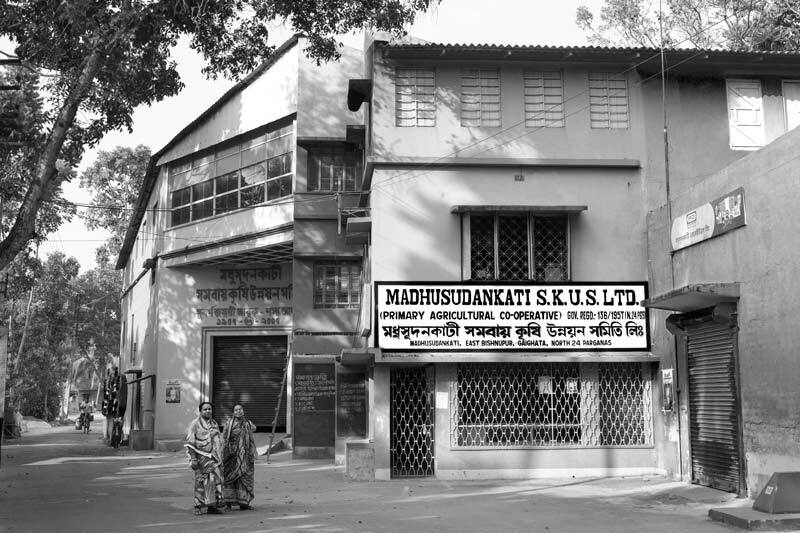 This has been done in partnership with a French organisation called '1001 Fontaines' and the local farmers' cooperative named 'Madhusudankati Samabay Krishi Unnayan Samity Ltd.' (MKSKUS), the office of which in the village is shown in the photo above. 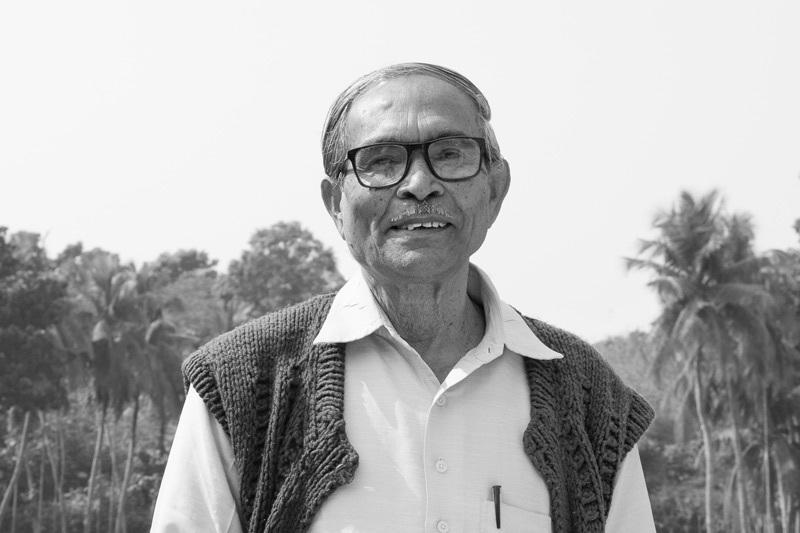 According to Kalipada Sarkar, the cooperative society had earlier tried to address the arsenic problem by treating contaminated groundwater with alum and chlorine for arsenic removal. However, the plant could not produce zero-arsenic water. Later when MKSKUS learnt that surface water, in particular rainwater, was the best way to combat the arsenic menace, they approached SISSO for support. Following their request, the founder of SISSO, Dr. Bindeshwar Pathak visited MKSKUS and Madhusudankati village, leading to design and implementation of the Sulabh safe drinking water project which has been successfully operating since November 2014. The major innovative feature of the project, particularly from the perspective of arsenic mitigation, is safe drinking water production from pond as a surface water source. Being harvested rainwater, it is naturally arsenic-safe. As Mr. Sarkar explains, the pond is owned by MKSKUS and has an area of approx. 43,200 sq. ft. (three bighas), with a depth of about 18 ft. Another equally deep but smaller pond, personally owned by Mr. Sarkar, lies adjacent and helps recharge the main pond. If needed, it also supplies additional water to the main pond since the two are interconnected. The pond which is the source of the drinking water that is treated and ultimately packaged is a protected water body in the village. It harvests rainwater from a large catchment which has lush green vegetation that helps in enhancing recharge. 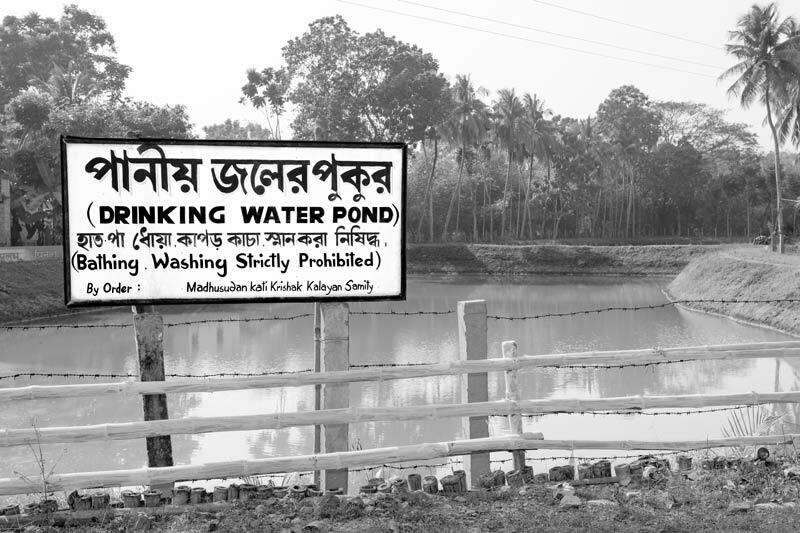 Once a multi-purpose pond that was used for washing, bathing, watering of animals, and even to raise fish, today it is reserved only for drinking and the water is clean, as seen in the photo above. No one in the village ever tries to trespass or misuse it for any other purpose, because everyone is convinced about its value as a safe drinking water source. No wastewater from the settlement or agricultural runoff from the fields is allowed to flow into it. The pond has been fenced along its three edges for protection. Along one of the edges of the drinking water pond lies the village settlement. 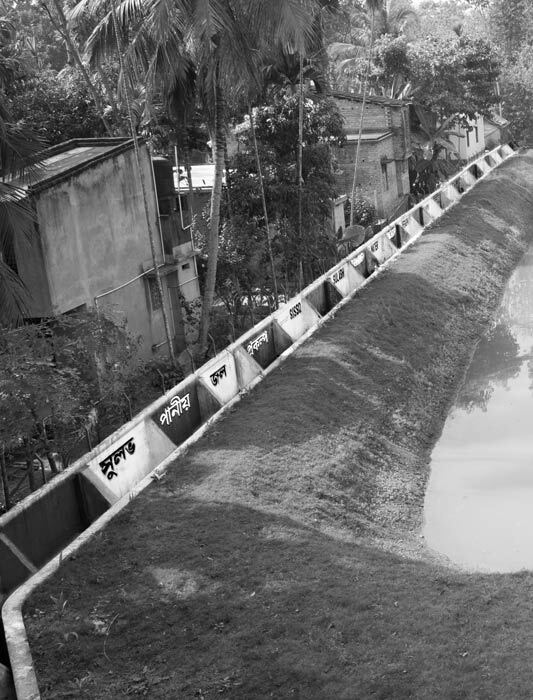 To protect the pond from any wastewater drainage coming from the settlement, a boundary wall has been constructed all along the length, as shown in the photo above. 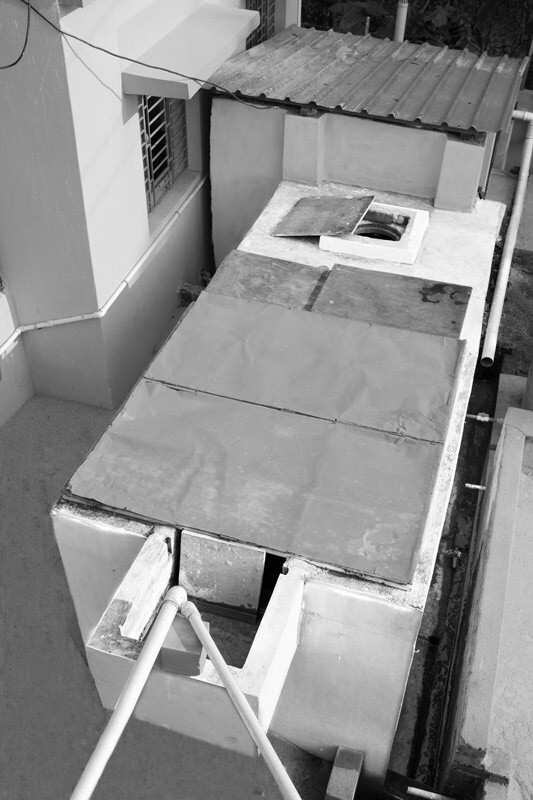 A drain bordering the wall carries away any wastewater or runoff generated from the settlement. The project building shown in the photo above houses the project office, the water treatment and bottling unit, water testing laboratory, and a library, besides guest rooms and a conference hall upstairs. It is noteworthy that the total installation cost of this innovative decentralized community-based project was only about Rs. 1.9 million (approx. 27,500 USD), and the project is completely self-sustaining today, regenerating the installation cost as well as supporting all maintenance costs. The installation costs included supply and installation of mechanical units, construction of civil works for the water treatment plant and laboratory, laboratory equipment, delivery van, 20 litres jars, salary of three plant operators for six months, training, and awareness program. The project cost and responsibilities have been shared between SISSO, 1001 Fontaines and MKSKUS. SISSO played the key role including conceptualizing the project, providing financial support for several components, facilitating with resource persons for training and awareness generation, and overall supervision and monitoring of the work. 1001 Fontaines conducted the initial project planning, provided technical design and required equipment for the plant, technical training to project staff and monitored the project execution including the trial run. The overall responsibility for project implementation lies with Madhusudankati Krishak Kalyan Samity (MKKS) which is an auxiliary organization of MKSKUS engaged in general social welfare of the farmers. 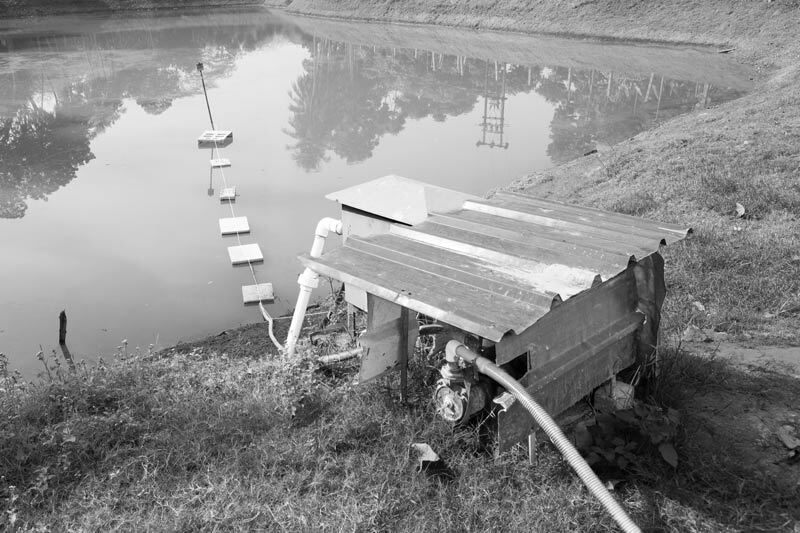 The raw water from the pond is drawn using an electricity-driven pump, as shown in the photo above. 6,000-8,000 litres of water is drawn on a daily basis. The pumped water is stored in two large overhead tanks of 5,000 litres capacity each. This raw water is first given a pre-treatment in the tanks and filter chambers outside and then this pre-treated water is made to enter the main treatment unit located inside the project building. The tanks where the pumped water is received serve as flocculating tanks where alum and bleaching powder are added to the water and stirred mechanically through a driven rod fitted with propeller. After stirring for 15 minutes, the solution is allowed to settle for about eight hours, and later the supernatant water is drawn out. Alum (or Aluminum sulfate) reacts with the bicarbonate alkalinities present in the raw water and forms a gelatinous precipitate. This floc attracts other fine particles and suspended material in the raw water and settles down at the bottom of the tank. The water over this sediment is almost clean other than some fine dissolved particles. Bleaching powder (or Calcium hypochlorite) is used for disinfecting the water since chlorine contained in the powder kills bacteria present in the water. 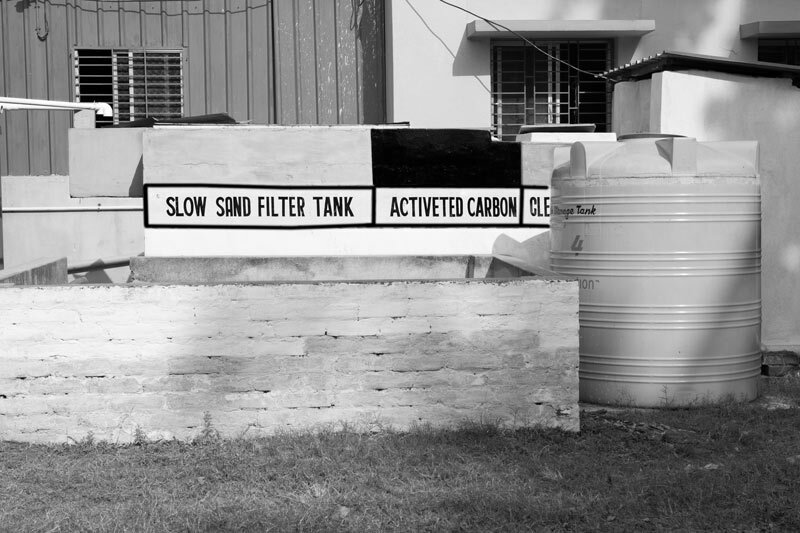 The supernatant water from the flocculating tanks is next made to pass through a slow sand filter that contains a sand and gravel bed and thereafter a chamber containing activated carbon bed, these being shown in the above photo. 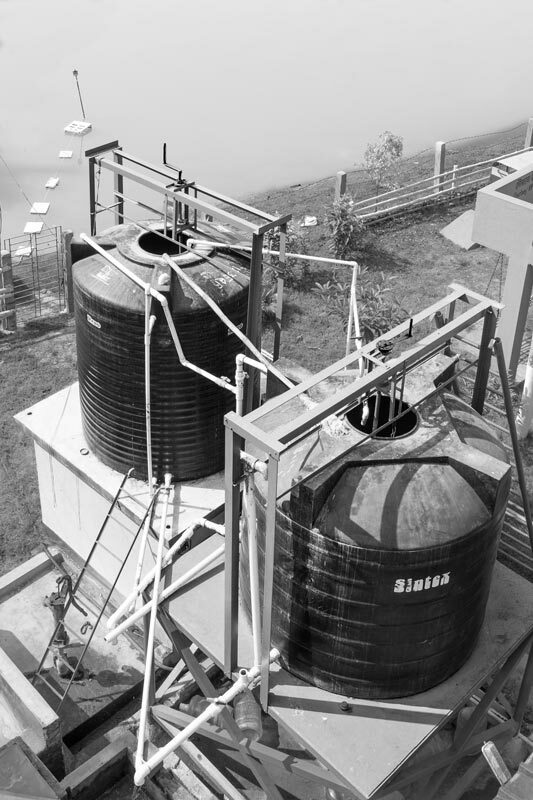 The slow sand filter further removes turbidity and pathogenic organisms through various biological, physical and chemical processes, trapping small organisms, algae, zooplankton, suspended dirt particles of the floc formed during pre-treatment, and any other large particles remaining in the water. The activated carbon bed helps remove any chlorine gained from the bleaching powder, eliminate unpleasant odors and tastes, and remove organic pollutants naturally present in the water. The filtered water emerging from the activated carbon bed is collected in a 'clear water tank' from where it enters the main purification unit located indoors. Water from the clear water tank located outside is first pumped through the activated carbon filter which helps further remove any organic sources of unwanted taste and odors, pesticides or chlorine-containing compounds. However, it is not effective for removing microbial contaminants. The 60µ cartridge filter membrane serves as a prefilter helping protect the other three more advanced filter membranes from fouling by particles and other large impurities. The 10µ, 5µ and 1 µ membrane filters help with microfiltration, separating smaller suspended materials from the water. Finally, UV radiation is used for treating bacteria and viruses, disinfecting the water. The water that emerges from the treatment plant after UV radiation is safe for human consumption. It is ISO-certified, free of pathogens and by virtue of being derived from rainwater, it is free of arsenic and iron (otherwise common in groundwater in W.B.). The water from the UV filter is filled into 20 litres plastic jars. Everyday 300 such jars are packaged. In addition, some one litre and 600 ml bottles are also occasionally packed which are supplied on special demand. 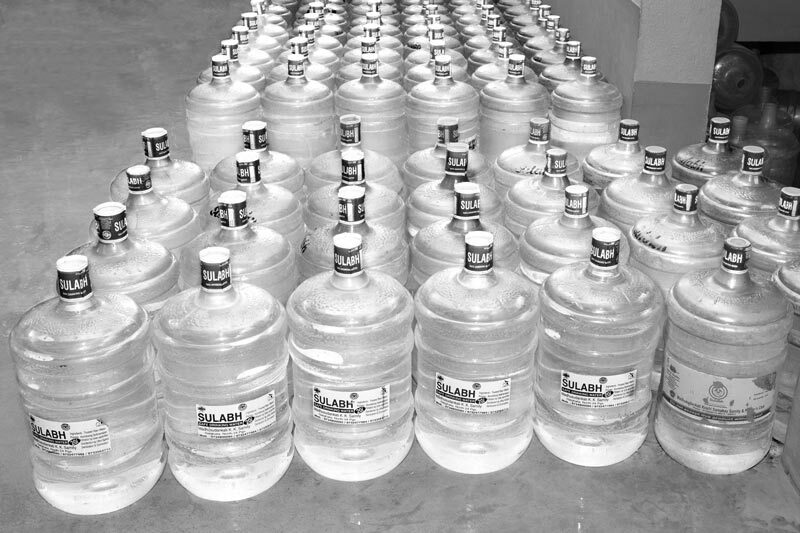 All bottles and jars are properly sterilized with chlorine solution before bottling and are immediately sealed after being filled. The 20 litres jars are either collected in person by the local consumers or transported by MKKS in a van that has been provided by SISSO. The cost of a jar at the production centre is Rs. 12 (approx. 0.17 USD) while when transported to the doorstep within a range of 4 kms, it costs Rs. 14 (approx. 0.20 USD). Beyond 4 kms, the cost increases to Rs 16 (approx. 0.23 USD). Arsenicosis patients, schools and ICDS child care centres are supplied with the packaged safe drinking water free of cost. The packaged drinking water is supplied within village Madhusudankati as well as outside in three other villages, namely Teghoria, Bishnupur, and Faridkati, besides in a part of the adjoining municipality of Gobardanga. Consumption of arsenic-rich water leads to development of arsenic toxicity or arsenicosis which may start manifesting after six months to two years of exposure. Among most common symptoms are melanosis, leucomelanosis, keratosis, hyperkeratosis, non-pitting edema, gangrene, cancer, renal failure and skin lesions. In the area served by the Sulabh Safe Drinking Water project, which includes the villages Madhusudankati, Faridkati, Bishnupur and Teghoria, and a part of Gobardanga municipal area, 40 patients have been identified as suffering from arsenicosis. These patients are slowly recovering from the symptoms through consumption of the packaged arsenic-free drinking water from the pond. 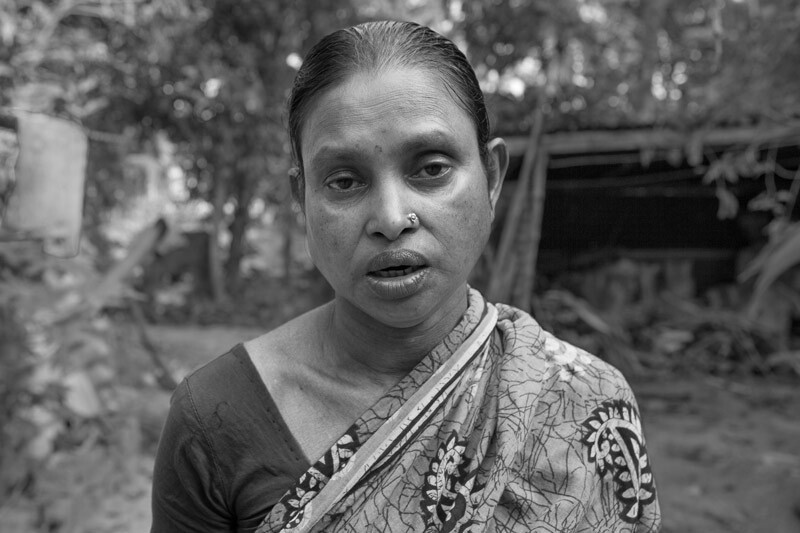 Nomita Biswas, shown in the photo above, is one of these patients. 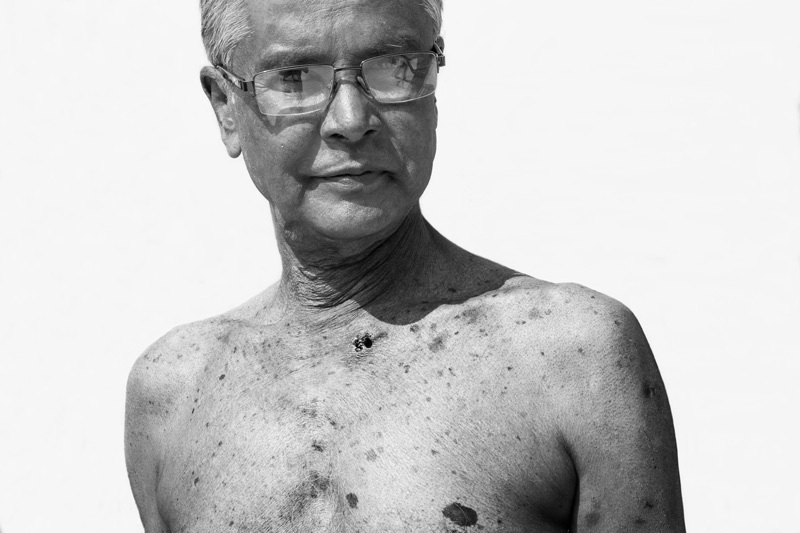 Narendranath Biswas, showed symptoms of arsenicosis in the form of spotted melanosis on the chest and arms. However, as a result of consumption of packaged drinking water from the pond, he has started recovering. According to Kalipada Sarkar, who is also the advisor to MKKS that operates and manages the drinking water treatment plant in Madhusudankati, the treated pond water packaged and sold under the name of 'Sulabh Jal' has high acceptability in the community and the demand is ever-increasing. In general, people are highly motivated to use rainwater as safe drinking water that can help address the arsenic menace. However, the capacity of the pond is limited by the available rainfall, and therefore it is not possible to produce more than 6,000 – 8,000 litres per day. He looks forward to starting of more such pond water-based treatment plants in the area so that arsenic-safe water can be sustainably supplied to populations at risk. He holds the opinion that government must help 'scale-up' decentralized pond water-based arsenic-free drinking water schemes as an efficient and sustainable arsenic mitigation option. According to Prof. Nath, who is also the Hony. 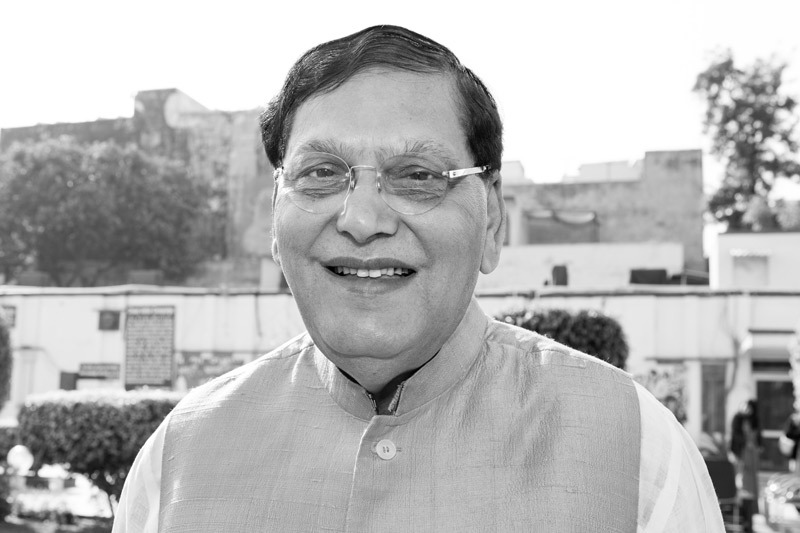 Vice-Chancellor of the Sulabh International Academy of Environmental Sanitation and Public Health (IAESPH) and closely associated with the Sulabh Safe Drinking Water project, the beauty of this project lies in the decentralized approach and the simple, pragmatic and user-friendly technology. Further, while the water of hundred thousand of ponds dotting the Gangetic Plains especially in eastern India (where the arsenic menace is strongly rooted) is going waste, arsenic-safe water from distant rivers is being transported through large expensive piped water schemes, which are unmanageable. 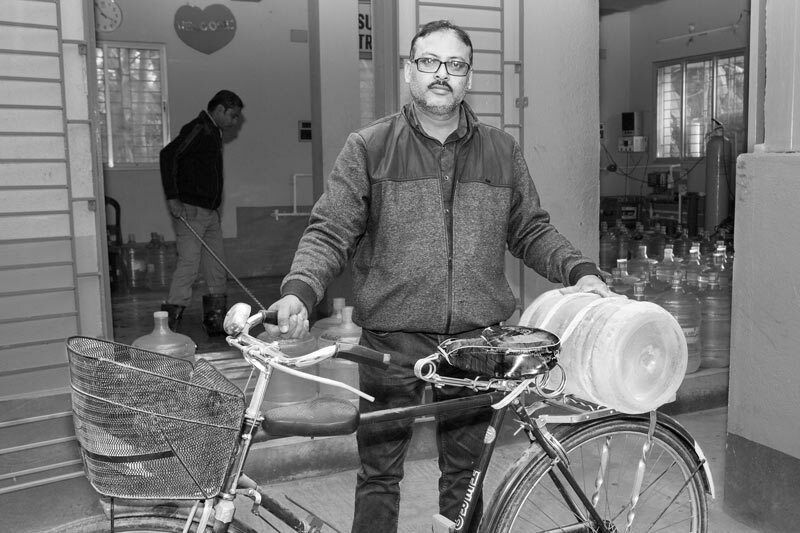 He sees the Sulabh innovation as a tool for empowering village women and men, developing skill in them so that they can treat their own water, providing safe water at a low cost, thus enabling local communities to be self-sufficient in drinking water supply. Given its merits, he believes that government should help SISSO to scale-up this innovation in quality-affected areas. 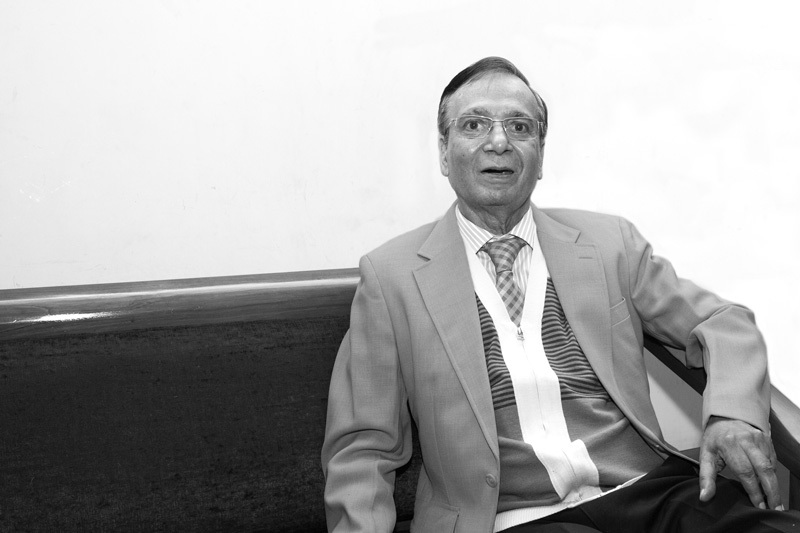 Dr. Bindeshwar Pathak, widely known as the founder of the Sulabh Sanitation Movement steered by SISSO, has received several national and international awards and accolades for his untiring efforts in promoting safe sanitation and eliminating the practice of manual scavenging in India. According to Dr. Pathak, water and sanitation are inextricably connected. Therefore, SISSO is now concerned with striving to help people attain their right to safe drinking water alongside sanitation. 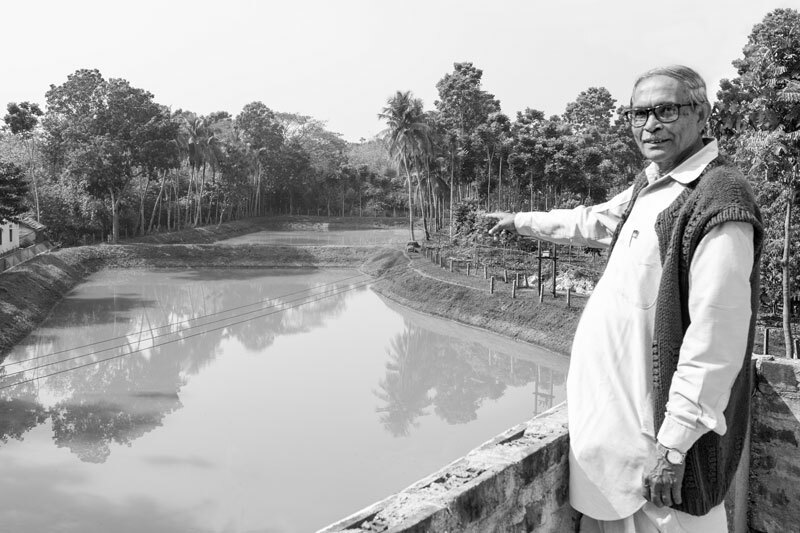 The Sulabh Safe Drinking Water project initiated in Madhusudankati based on harvested rainwater from pond, has been replicated in arsenic-affected Suvasgram, South 24 Parganas, and fluoride-affected Shantiniketan, Birbhum district in W.B. A similar plant has been started in Darbhanga, Bihar. New pond-based projects are coming up in arsenic-affected Namkhana in South 24 Parganas and at Amulia in North 24 Parganas districts in W.B. and also in Tripura. Dr. Pathak looks forward to scaling-up this decentralized pond-based safe drinking water supply system to larger quality-affected areas, collaborating with government and other agencies. Sulabh's unique contribution to combating the arsenic menace through the first ever pond-based safe drinking water supply project in India brings many merits over all other alternatives so far in place. 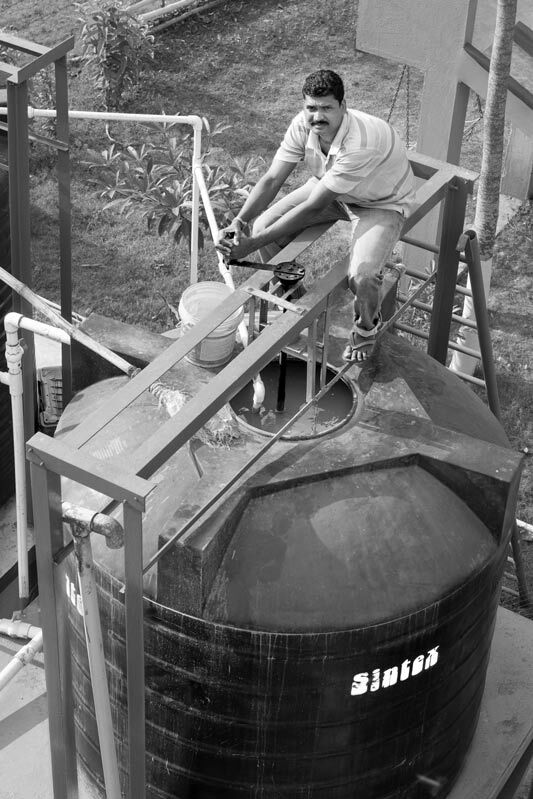 Of the two major approaches in practice, the first one - treatment of the contaminated groundwater to remove arsenic - has been applied widely but presents several challenges such as high costs, inefficiency in arsenic removal in the field situation, complexity of technology making community management difficult, and questions of proper management of sludge and the used media. The second one - supply of arsenic-free water sourced from either arsenic-safe aquifers or surface water from rivers – is being increasingly adopted. However, supply of arsenic-safe groundwater (generally from deep aquifers), is technologically easy but not a sustainable solution because of the possibility of arsenic contamination of safe aquifers over time. Even supply of treated surface water from rivers through centralized multi-village piped water supply schemes have limitations. These are expensive and often inefficient due to issues like irregularity of operation, insufficient capacities to fulfil demand, breakage and pilferage along the mains and distribution networks, and lack of public control over operations in case of problems by being centralized and distant. Even the resource itself may present limitation due to huge multi-sectorial demands placed on the river water and pollution in the source itself. Against these limitations, the Sulabh innovation described above presents several merits. First, it is a nature-based solution rooted in the traditional wisdom of rainwater harvesting through ponds, an age-old practice in W.B., which makes it culturally acceptable and environmentally sustainable. The State receives a good average annual rainfall of 1,750 mm, a substantial part of which gets stored in thousands of traditionally existing ponds. According to government sources, over the last few years, more than 70,000 new ponds have been further added under government schemes. The innovation is also environmentally sustainable because unlike groundwater-based plants, there is no groundwater extraction, nor any artificial chemical-driven removal of arsenic or worries about safe disposal of the sludge. The practice of harvesting rain in the pond further brings the secondary benefit of recharging groundwater in general, thus lowering the arsenic concentration through dilution. Second, unlike large centralized multi-village surface water supply schemes that depend upon rivers supplying water from distantly placed mains through kilometers of unattended piped distribution networks, the project represents a decentralized approach where the core water resource, the water treatment process and the manpower are all localized in the community. This enhances community control and brings credibility, in turn boosting operational effectiveness and sustainability, which is the most significant problem in case of large centralized water supply schemes. Third, the technology for the treatment process is simple which makes it easy to use and maintain with little training. This has enabled efficient handling and maintenance by men and women from the local community. Fourth, is the local availability and affordability of the components of the technology – these are quite cheap and available in the local market, thus eliminating run-down time. Fifth, is the operational and management aspect by virtue of being handled by a grassroot organization that is committed to the cause of welfare of the local farmers and residents. This enables regular operation, maintenance and repairs through permanently employed staff, bringing accountability in the project. 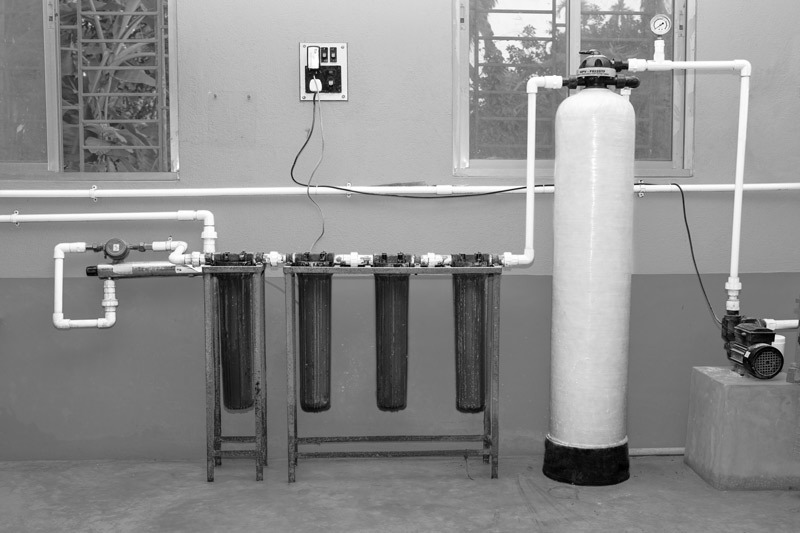 Sixth is the cost-effectiveness – the water treatment unit itself is quite affordable, costing only about Rs. 800,000 (approx. 11,500 USD), and operational and maintenance costs are low. Finally, Sulabh's management approach of 'pay-and-use', which has been the hallmark of their sanitation approach, enables financial sustenance of the project. Through a nominal payment of much less than one rupee (approx. 0.02 USD) per litre, the consumers support the cost of the treatment process, labor cost of the caretaker staff, transport cost, etc. This ensures project sustainability on the one hand, and equitable safe drinking water access on the other. It can be said that through the MKKS, which is a sister organization of the local farmers' cooperative, the local community actually owns, operates and manages the project. Given the exclusive benefits that the Sulabh innovation described above brings in supplying safe drinking water for all in arsenic-affected areas in particular and quality-affected areas in general, it has great potential of being scaled up nationally and replicated in areas beyond W.B. and Bihar. It can be used for supplying safe drinking water in fluoride, salinity and other quality-affected areas like Gujarat, Rajasthan and the Peninsular India, and for purifying surface water for drinking in general to protect from microbial infections, wherever ponds and tanks are traditionally in use. This nature-based solution has tremendous potential in utilizing these hitherto unutilized water resources in the country for producing safe drinking water, in turn promoting enjoyment of the human right to water and the connected rights to health, education and development by the women, men and children who have come to be marginalized in their access to safe water due to quality problems. Further, through a simple, user-friendly, culturally acceptable, affordable, efficient, and environmentally sustainable technology, it will help ensure that no one is left behind in accessing safe drinking water, thus helping reach the Sustainable Development Goals. Home I All Photo Stories I Feedback I Terms and conditions I © Copyright 2019 Nandita Singh & Om Prakash Singh. All rights reserved.